I’m the marketing manager over at Horner APG, a global industrial automation control company, currently responsible for the design and development of our new website. It’s no secret that I’m huge fan of WooCommerce. The Woo team is simply creating a wonderful product backed by a great community of support. I may have stepped out a bit from the norm by choosing it to power our corporate store but I think it’ll pay off in the long run. While building our new site I noticed our old store included links to product videos powered by YouTube. By default, as designed by WordPress, videos are not supported by the WordPress image gallery. As a result, I started looking for a solution that would modify the default behavior to accept external links. Below is the solution I used to make that happen. Geekee Media has since updated the code below and it’s freely available on Github if you’d like to grab the latest version which I haven’t tested yet. Hit me up in the comments below if this process works with his latest code submission. Add the first block of code below to your functions.php file. Add the second block of code below to your functions.php file. I’ve modified it to include a unique link ID (id=”tip4″) that’s being called in my footer with specific Fancybox settings. I know it’s not the cleanest process but I’ll leave it to you to tidy it up. Add the third block of code to your footer (Fancybox settings). 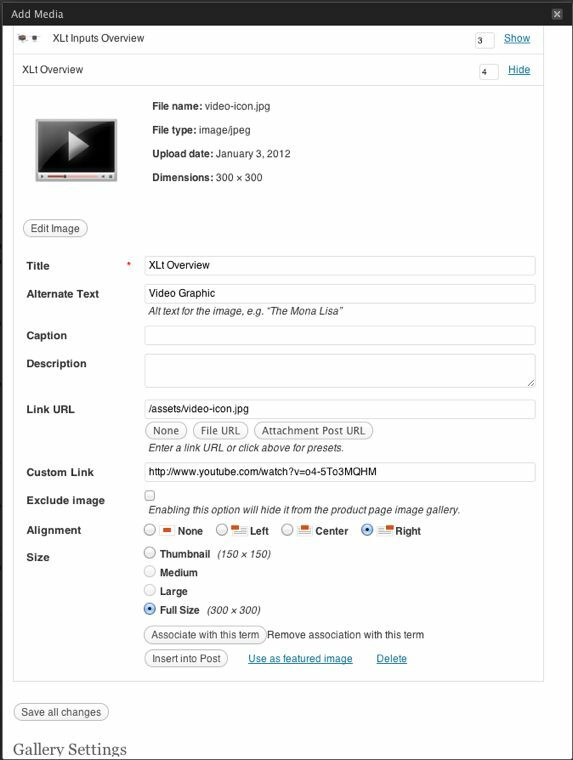 Edit your product and upload an image ( ex: video player ) that signifies the gallery link will be of a video. You’ll see from my screenshot that I’ve included a link to YouTube where my video is hosted. Adds a custom field to your image gallery that you’ll use to include your video link. Then I assigned a specific ID to the video link. This class triggered the Fancybox plugin that currently powers the WooCommerce product image gallery. This snippet of code is to trigger the Fancybox plugin. Edit the settings for your purposes. I’m by no means the strongest coder. So if you cook up a better solution please share it with the rest of us. Maybe I don’t need the full second block of code? I know I was having issues a few months ago with product image order so part of the second block of code probably includes my fix. It might not be needed any longer or an issue specific to my project. Hey Ben. It appears as though you are the only person on the internet trying to add video to WooTheme products! I tried what you posted here (looks like you have a ton of other cool stuff as well! ), but, unfortunately, when I click on the thumbnail it takes me directly to the Youtube video, bypassing fancybox… Any ideas? Apologies for the late reply. Any JS errors showing up in firebug console? Sounds like it’s not triggering fancybox for some reason. I can help you figure this out. Feel free to hit me up on twitter @benvblanco. I’m usually more responsive. Edit: Also, make sure to grab the latest code/plugin from Github. I recently updated to the plugin and with the fancybox trigger it works great. Steve, did you ever get this to work? I’d love to get this working, but the having the same problem you are. Forgot to add to make sure you use the old youtube video link from the old embed code. There’s a checkbox available on YouTube to grab it. I don’t think their new short-links work with the scripts. Think this would work with Vimeo as well? I’ll setup a test install with Woocommerce and this plugin. I’m sure we can get Vimeo to work. I’ll try to help out the best I can. Feel free to hit me up on Twitter or via email. Are you running the latest version of Woocommerce? Is there any problem? When I paste code 1 & 2 into function.php I get to see huge text in my website & dashboard. Whats the wrong? AND I didn’t get any footer.php in my theme. Please help. I haven’t tested this code with the latest version of WooCommerce in a long time. My best advise is to use the latest version of this plugin instead of copying the code above. Let me know if that helps. I’ll test again soon and update this post accordingly. Hi, I’m so frustrated. Your code works, but it opens the youtube video across the entire browser. I tried the new code you pointed to, but that doesn’t seem to work for the woocommerce gallery. So, I don’t know what I’m doing wrong. First I tried to put your 3rd piece of code in footer.php, but that screwed up the site. Then I added a php widget to the footer and pasted your code in there, but that doesn’t seem to do anything irregardless of the format of the YouTube code I use. I then tried to use the vimeo guy’s code, but I guess I’m putting this code in the wrong place, because that didn’t do anything either. I also installed a fancybox plugin, but maybe I need a specific one? So far, I’ve got the video loading when I hit the image (thanks to your first 2 pieces of code) … THANK YOU! … but I can’t seem to get the formatting right.